“So is the US a country or a continent?” the auto-driver asked me as we puttered up Residency Road on our way to IISc. John sits in traffic, in autorickshaw. Can you see Pam in the mirror? 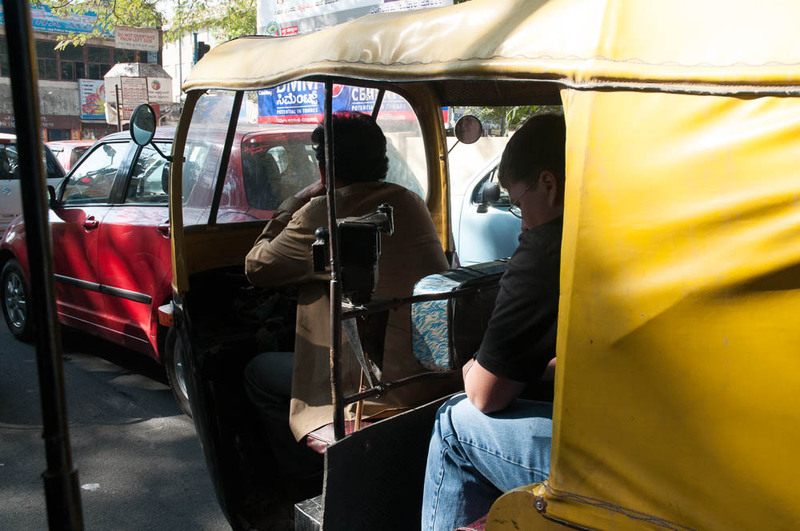 Normally, I don’t have much of a conversation with the driver of an autorickshaw, the ubiquitous three-wheeled taxis that ply the streets of Bangalore and most other Indian cities. The conversation usually is limited to my attempt to describe where I want to go and their attempt to convince me that their meter is broken and that I should therefore pay triple the appropriate price for the trip :-). One of the things I like about autos, however, is that their open-air construction and the frequent lengthy stalls in traffic encourage chatter between the auto driver and nearby auto drivers. It’s not uncommon to have one auto driver ask another for directions, or for motorcycle riders to chat with an auto driver, all while stopped for a light. We talked on like this. He noted that the US had just had elections; Obama had won again? yes, I confirmed. “Indian democracy is not good,” he said, “ninety percent of politicians are corrupt.” I decided not to pursue the topic of politics too far, so I switched to a safer topic. I noted that there are many new autos on the road, all green on the bottom instead of black, and labeled “LPG”. He confirmed that all new autos must be LPG, which is cleaner than the stinky diesel units of the past. He lamented that the newer machines were much harder (and more expensive) to service, however. Nice fellow. I asked him where he was from – was he from Bangalore itself? “Ninety percent of auto drivers are from Bangalore,” he told me. Interesting; the city has many migrants from all over the country so I assumed otherwise. I wished him well and we went our separate ways.